A couple of months ago, I had applied for a free sample of the potato skillet thing from Betty Crocker… after which I completely forgot about them. Then a couple of weeks ago, my free sample arrived in the mail! I bought these cute little mini sausages at the grocery store. I had made the potatoes the night before, so put them both together, and yum yum yum! Cook the potatoes, according to the directions on the box. 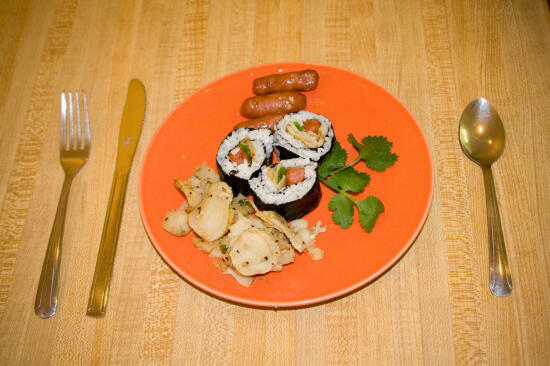 Roll the sushi, using about 1/3 cup potatoes, 1 stalk of green onion, and 4 sausages as your fillings. 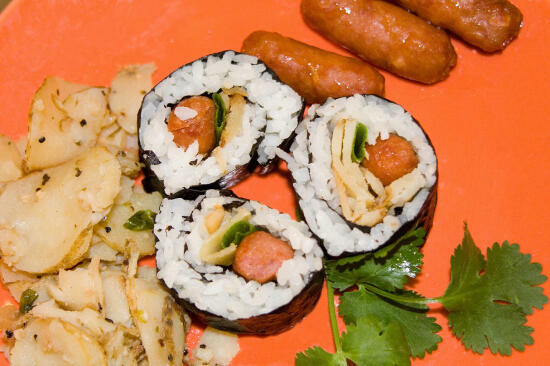 Serve with ketchup (or whatever you prefer with your sausages and potatoes). Enjoy! Sounds interesting. 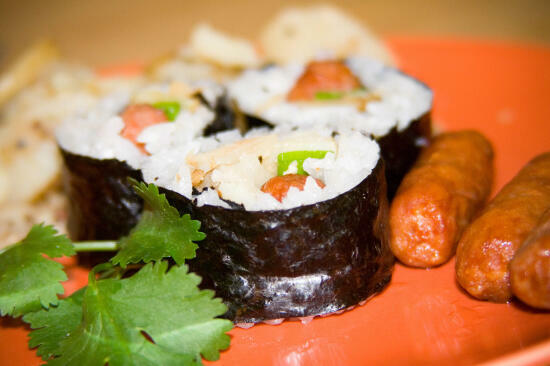 Do you still dip in wasabi and soy sauce? Joe, if you want something to spice this roll up. I would suggest dipping it in some Sriracha. It tasted pretty good to me…but then again, I put hot sauce on just about everything I eat.